The good news for patients who choose to replace missing teeth with an implant supported restoration is that they have an astounding 95% success rate. However, that still means that 5% of implants fail. While it is a rare occurrence, implant failure can happen. Before you move forward with an implant supported tooth replacement plan, read this post to find out more about the common causes of dental implant failure and how you can do your part to keep your implant firmly in place for a lifetime. If an implant fails, we may be able to replace it. In some cases, improved hygiene and/or use of antibiotics is adequate to allow for successful implantation. In other cases, we may need to complete a bone or soft tissue graft prior to reattempting placement. Unfortunately, some patients are just not good candidates for dental implant supported tooth replacement. For these patients, we may need to find an alternative tooth replacement option. The easiest ways to improve your dental implant success rate is to carefully follow your dentist’s post-operative instructions. 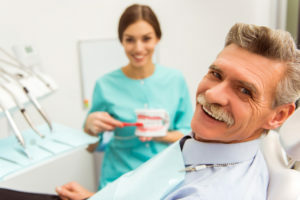 You will also need to maintain thorough at-home hygiene and regular office visits to ensure your gums, jaw, and oral structures remain healthy. You need to remain healthy to ensure complete dental implant success. Patients also need to know the warning signs of implant failure and contact their dentist right away. Some discomfort and inflammation following the placement of implants is normal, but if you continue to experience severe pain or discomfort or notice severe swelling days or weeks after placement, your implant may not be healing properly. Once your dental restoration is in place, signs of implant failure will likely become even more obvious. Your replacement tooth or teeth may feel loose. In some cases, you’ll be able to see the implant post between the gums and replacement tooth. If any of these issues occur, call your dentist immediately. At the Dallas dental office of Dale W. Greer, DDS, we are happy to offer dental implant supported tooth replacement options. Whether you’re missing a single tooth or a full row of teeth, Dr. Greer and his team can help. Before you move forward with dental implant tooth replacement, talk to our team about possible causes of implant failure. We’ll walk you through at-home care to improve your chances for successful dental implant placement. Don’t hesitate to call our Dallas dental team right away if you notice any of the warning signs of implant failure.